Next year will be the 450th birth anniversaries of Galileo and Shakespeare. Last week's New Yorker has a beautifully written piece by Adam Gopnik on Galileo that wonders what Shakespeare would have written about his contemporary. Actually he delegates that responsibility to Bertolt Brecht and his famous play, Galileo. The article is very good but it also reinforces couple of misperceptions. For example, it uses the famous 19th century painting of a defiant Galileo above as the set-piece for the article. The problem is that from what is known, Galileo was a frail old man when he came up in front of the inquisition and he did not want to offend them. And the inquisition itself wanted a way out as well and struck a plea bargain with him that would have let him off with a slap on the wrist. It was the Pope - the former friend of Galileo - who overrode the plea agreement. This is not to say that the treatment of Galileo was not shoddy and unjust. But that it is always good to read an article that also gets smaller thing right. The painting more reflects the view of the Church in the 19th century than a depiction of Galileo in front of the inquisition. Gopnik also implies that Giordano Bruno was burnt at the stake because of belief in the plurality of the worlds. While Bruno did believe in the plurality of the worlds, and that was indeed considered heretical by the Church, there were also many more reasons for the Church to be angry about. It would be misleading to cherry-pick the reasons four centuries later (See this earlier post: Why was Giordano Bruno Burnt at the Stake?). Although Galileo and Shakespeare were both born in 1564, just coming up on a shared four-hundred-and-fiftieth birthday, Shakespeare never wrote a play about his contemporary. (Wise man that he was, Shakespeare never wrote a play about anyone who was alive to protest.) The founder of modern science had to wait three hundred years, but when he got his play it was a good one: Bertolt Brecht’s “Galileo,” which is the most Shakespearean of modern history plays, the most vivid and densely ambivalent. It was produced with Charles Laughton in 1947, during Brecht’s Hollywood exile, and Brecht’s image of the scientist as a worldly sensualist and ironist is hard to beat, or forget. Brecht’s Galileo steals the idea for the telescope from the Dutch, flatters the Medici into giving him a sinecure, creates two new sciences from sheer smarts and gumption—and then, threatened by the Church with torture for holding the wrong views on man’s place in the universe, he collapses, recants, and lives on in a twilight of shame. It might be said that Brecht, who truckled to the House Un-American Activities Committee—“My activities . . . have always been purely literary activities of a strictly independent nature”—and then spent the next bit of his own life, post-Hollywood, accessorized to the Stalinist government of East Germany, was the last man in the world to be pointing a finger at someone for selling out honesty for comfort. But then the last man who ought to point that finger is always the one who does. Galileo’s shame, or apostasy, certainly shapes the origin myth of modern science, giving it not a martyr-hero but a turncoat, albeit one of genius. “Unhappy is the land that breeds no heroes,” his former apprentice says at the play’s climax to the master who has betrayed the Copernican faith. “No,” Galileo replies, “unhappy is the land that needs a hero.” It is a bitter valediction for the birth of the new learning. The myth that, once condemned, he muttered under his breath, about the earth, “But still, it moves,” provides small comfort for the persecuted, and is not one that Brecht adopted. Although the twinship of Shakespeare and Galileo is one that we see retrospectively, another, even more auspicious twinning was noted and celebrated during Galileo’s lifetime: Galileo was born in Pisa on the day that Michelangelo died. In truth, it was probably about a week later, but the records were tweaked to make it seem so. The connection was real, and deep. Galileo spent his life as an engineer and astronomer, but his primary education was almost exclusively in what we would call the liberal arts: music, drawing, poetry, and rhetoric—the kind of thing that had made Michelangelo’s Florence the capital of culture in the previous hundred years. Galileo was afflicted with a cold and crazy mother—after he made his first telescope, she tried to bribe a servant to betray its secret so that she could sell it on the market!—and some of the chauvinism that flecks his life and his writing may have derived from weird-mom worries. He was, however, very close to his father, Vincenzo Galilei, a lute player and, more important, a musical theorist. Vincenzo wrote a book, startlingly similar in tone and style to the ones his son wrote later, ripping apart ancient Ptolemaic systems of lute tuning, as his son ripped apart Ptolemaic astronomy. Evidently, there were numerological prejudices in the ancient tuning that didn’t pass the test of the ear. 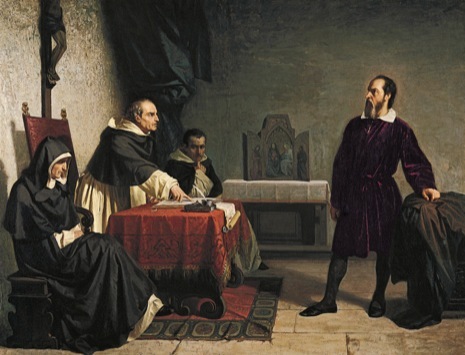 The young Galileo took for granted the intellectual freedom conceded to Renaissance musicians. The Inquisition was all ears, but not at concerts. Part of Galileo’s genius was to transfer the spirit of the Italian Renaissance in the plastic arts to the mathematical and observational ones. He took the competitive, empirical drive with which Florentine painters had been looking at the world and used it to look at the night sky. The intellectual practices of doubting authority and trying out experiments happened on lutes and with tempera on gesso before they turned toward the stars. You had only to study the previous two centuries of Florentine drawing, from the rocky pillars of Masaccio to the twisting perfection of Michelangelo, to see how knowledge grew through a contest in observation. As the physicist and historian of science Mark Peterson points out, the young Galileo used his newly acquired skills as a geometer to lecture on the architecture of Hell as Dante had imagined it, grasping the hidden truth of “scaling up”: an Inferno that big couldn’t be built on classical engineering principles. But the painters and poets could look at the world, safely, through the lens of religious subjects; Galileo, looking through his lens, saw the religious non-subject. They looked at people and saw angels; he looked at the heavens, and didn’t. Could he, as Brecht might have wanted, have done otherwise, acted more heroically? Milton’s Galileo was a free man imprisoned by intolerance. What would Shakespeare’s Galileo have been, one wonders, had he ever written him? Well, in a sense, he had written him, as Falstaff, the man of appetite and wit who sees through the game of honor and fidelity. Galileo’s myth is not unlike the fat knight’s, the story of a medieval ethic of courage and honor supplanted by the modern one of cunning, wit, and self-knowledge. Martyrdom is the test of faith, but the test of truth is truth. Once the book was published, who cared what transparent lies you had to tell to save your life? The best reason we have to believe in miracles is the miracle that people are prepared to die for them. But the best reason that we have to believe in the moons of Jupiter is that no one has to be prepared to die for them in order for them to be real. So the scientist can shrug at the torturer and say, Any way you want me to tell it, I will. You’ve got the waterboard. The stars are still there. It may be no accident that so many of the great scientists really have followed Galileo, in ducking and avoiding the consequences of what they discovered. In the roster of genius, evasion of worldly responsibility seems practically a fixed theme. Newton escaped the world through nuttiness, Darwin through elaborate evasive courtesies and by farming out the politics to Huxley. Heisenberg’s uncertainty was political—he did nuclear-fission research for Hitler—as well as quantum-mechanical. Science demands heroic minds, but not heroic morals. It’s one of the things that make it move. There is a lot more in the article. If interested in the subject, please read the full article here. Saturday Video: Sci-Fi short film "Grounded"